In 2012 after a 21 year break, Sunnyboys re-entered the fray at the behest of Dig it Up! the Hoodoo Gurus Invitational. Performing as Kids in Dust the band had agreed to regroup “just for fun and for old times’ sake.” Six years later and Sunnyboys 2.0 have notched up a resume the envy of any band – contemporary or vintage – including a co-headline appearance to 45,000 people for A Day On The Green 2015; a succession of sold-out shows at Sydney’s Enmore Theatre and the Sydney Opera House, a venue attendance record at the Coolangatta Hotel (previously held by Noiseworks) plus sold-out shows (multiple times over) in Melbourne, Byron Bay, Perth and more. Perhaps even more remarkable is that the 2017 edition of Sunnyboys (featuring all original members) have existed longer than the bright-eyed young men who burned so brightly back in the eighties but also burned-out so fast. The time around without the pressure of recording schedules and the demand for chart hits and with a mutual love and respect for the music they made, Sunnyboys can just do what they do best; play live. 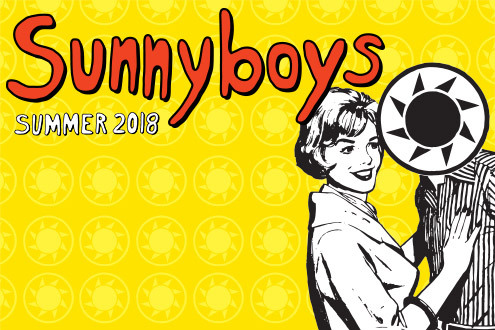 And play live they will as this summer Sunnyboys will performing a series of headline shows across venues big and small, regional and urban and ALL of them expected to sell out. The band will be performing material from across their entire catalogue including their three albums for Mushroom, the infamous debut ep on the Phantom label and even the odd b-side or rarity. For the Sunnyboys, every show is a celebration. Joining the fun will be Sydney surf-punks The Celibate Rifles, a hi-energy five piece who have carved out their own indelible history in the Australian music scene over a 35+ year period. The Rifles will join Sunnyboys for their first show on the Sunshine Coast since 1982; the Sunnyboys first Brisbane performance since 2015, and most other dates. While Melbourne fun-punks and former touring buddies Painters & Dockers, will join the rejuvenated Sunnyboys for their Melbourne Zoo performance. “Some bands re-group so they can play the hit songs and fly home, pockets jangling full of money. Watching the Sunnyboys perform felt like they were making up for lost years that should have been on stage. Graciously happy to be there and genuinely thrilled by the audience participation.” – Weekend Notes. special guests Flaming Hands & Shy Impostors. special guests Painters & Dockers.